Dad's Ultimate Buffet including Saisaki and Kamayan, has been a household name even before Vikings, Yakimix or Buffet 101 came into the picture. 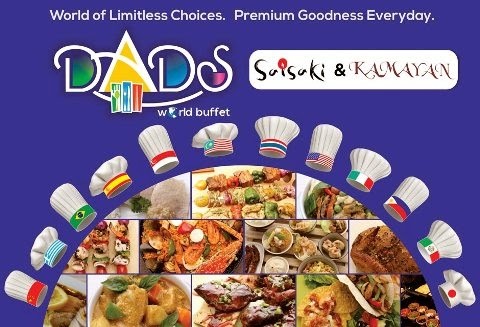 With the vision of bringing different cuisines, unique menu and diverse cooking styles from all seven continents in one place, the first of its kind culinary dream called Dad's World Buffet was born. Now, let me take you to a succulent tour around the world. I must admit that I was overwhelmed with the variety of dishes at Dad's World Buffet that I didn't know where to start! After making two rounds at the buffet spread, I finally picked up a plate and grabbed a few slices of Saba, Tuna, and Salmon Sashimi as my appetizer. Since Japanese is my favorite cuisine, I spent most of my time talking to the chef for his recommendations because I knew that I won't be able to taste everything in one night. His top picks include Sukiyaki and Yakitori, which I gladly devoured and finished to the last bite. I love that the restaurant has lived up to its name with the wide selection of dishes that will satisfy whatever cuisine you fancy. The staff are also very attentive to their customers, checking if we needed refill with our drinks or if we wanted to try something else from the buffet. My only, and probably the biggest concern is that the dishes on display were not kept warm during the duration of our dinner either because the air-conditioning was too cold or the food warmers are not efficient enough to keep the dishes at its best form and taste. Such was the case of Kamayan's Cebu Lechon which supposedly, has the crispiest skin there is available. 523 Merchant Bldg., Faura corner Adriatico Sts.